Provides R language support and interface between R environment and Komodo. This extension forked from “Sciviews-K” by Philippe Grosjean, and since then has been largely rewritten. execute (or source) the current line or selection, bookmark-delimited block, function at cursor, or a whole file. R object browser pane with fully expandable tree allows for inspecting objects' structure including attributes and hidden objects. This add-on provides a file type named “R_extended” to avoid conflict with Komodo's built-in R syntax highlighter. Code completion and syntax checking works only with “R_extended” not “R”. No additional R packages are required, however your R installation needs to have Tcl capability (by default it does. In R, check it with capabilities("tcltk")). See also Known issues below. load workspace from “.RData” files or source script from “.R” files: select a command from the context menu. hold "Ctrl" key during the drag start to drop full object names (e.g. list$data$column. Non-syntactic names will be backtick-quoted). hold both to insert “name()” for functions, “name=” for function arguments. filter items either by object name or class name (toggle the "filter by" button next to the search box), using regular expressions. Prefix the search term with "~" to filter out matching names. drag an item to the editor to insert package name. press Ctrl+R to run selected text in R (or choose the command from the context menu). While in an R_extended document, press Shift+F1 once to search for the selected keyword in the loaded packages. Press Shift+F1 again to search in all packages. Duplicate line or selection (assign to Ctrl+D to restore the good old pre-8 behaviour). “Smart highlight” marks all occurences of the word under the cursor in the current document. 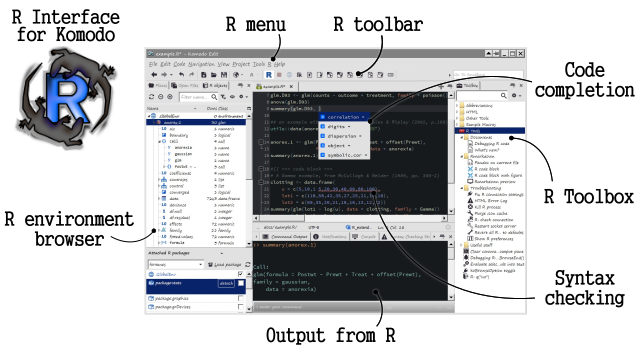 The extension provides some code debugging capabilities, see Debugging R code. For more advances uses, CommonJS module "kor/r" (or kor.r object in the main window) has functions to perform various tasks via R, and the "kor/connector" module has more low level functions for communication between R and Komodo, of which require("kor/connector").evalAsync(command, callback) is the most useful. Executing Rgui's command “Stop all computations” will also stop R's socket server and hence break the connection with Komodo. It may also cause R crash (it happens sometimes on Windows). On Linux, Tk-Gui sometimes does not close properly. It is not recommended to use it with this add-on. Problems with connection with Komodo server in R may cause R not exit properly and need to kill the R process (it happens rarely - perhaps a Windows-specific problem). Syntax highlighting: when R is a sub-language (in Rd or Rmarkdown files), the colouring dissappears occassionally. There is also some flickering inside Roxygen comments. This is due to a bug in Komodo related to brace counting.